Hiya guys! It's so odd for me to post on the weekends, isn't it? But that's when you know the polish is so good that it can't wait, haha. I'm actually really excited for this post because it comes from the first indie brand I ever purchased from Stardust Beauty (formerly Stardust Polish). 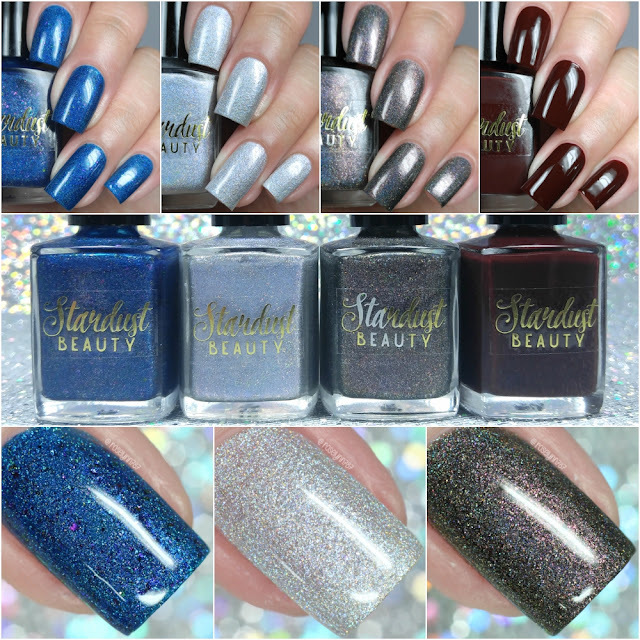 For today I'm sharing swatches for the Gods and Goddess Collection Part 2 by Stardust Beauty. Picking up from Part 1, this collection showcases four gorgeous shades inspired by their namesake god or goddess. Without further ado, let's get to the swatches. The Gods and Goddess Collection Part 2 by Stardust Beauty will be available for pre-order now until October 29th at 8PM EST. The collection will then be released in the shop on November 1st at 6PM EST. Each full-size 15mL bottle retails between $9 to $12, depending on the finish. Aeolus can be described as a blue linear holo with slight red shimmer & pink/purple/blue/gold chameleon flakies. Named after the god of air & wind. Starting off with my favorite among this collection and my pick for must-have. My photos really don't do the holo any justice in these photos, the sparkle in direct sunlight is gorgeous! 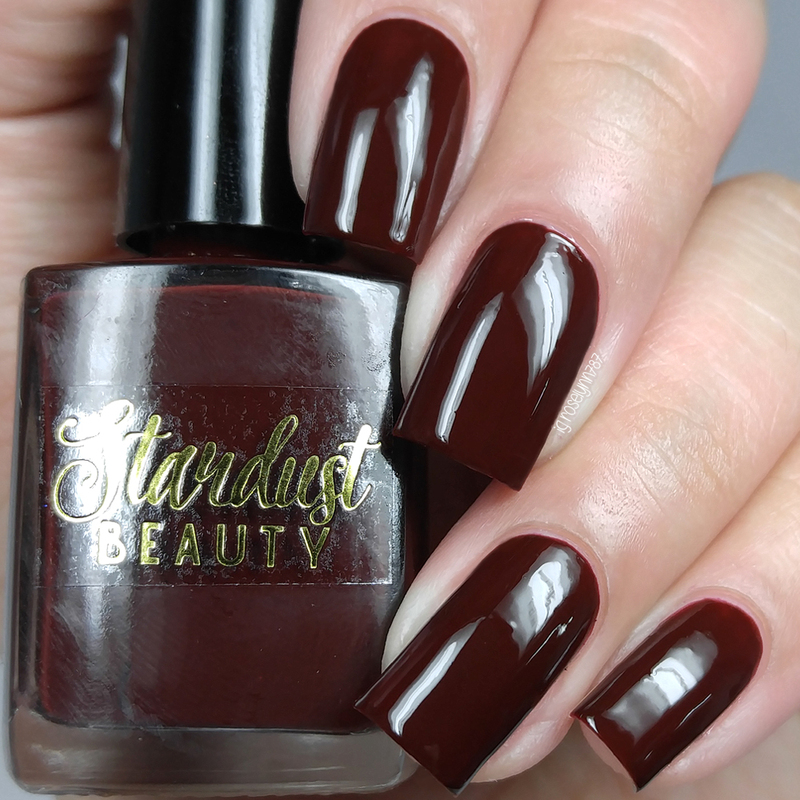 The formula has a sheer application with a nice even build-up and flakie distribution. Great consistency as well, not too thick or too thin. Shown in two to three coats and sealed with a glossy topcoat. Dionysus can be described as a deep red/burgundy creme. Named after the god of wine and pleasure. 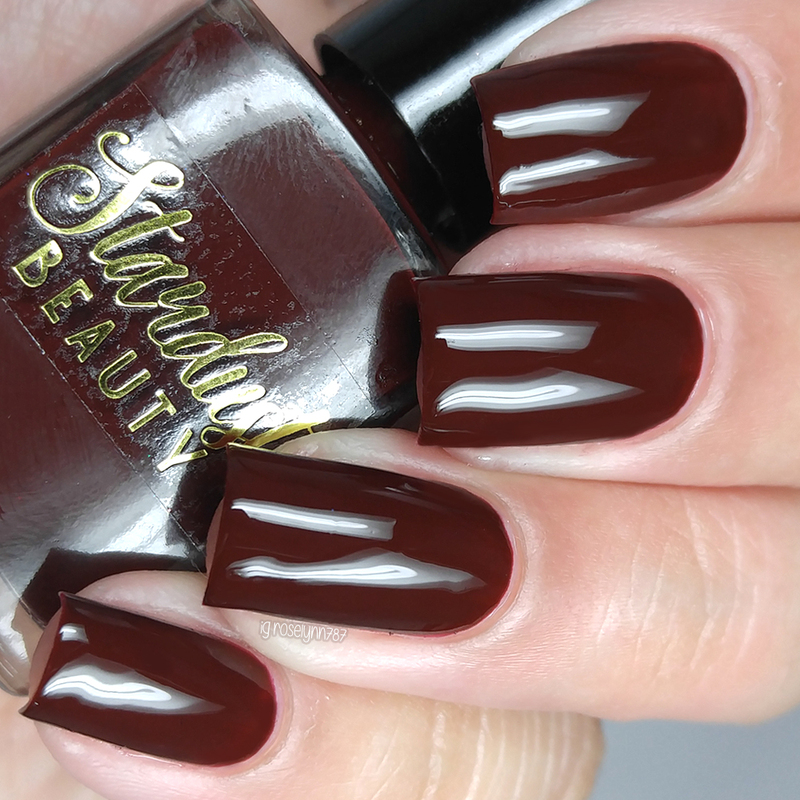 Both luscious and vampy, this shade is so incredibly stunning. Although I love the tone of the shade, I do wish it would have been more opaque. The formula has a streaky application that needs some layering for an even coverage. I experienced no staining on removal, but I did put on a base-coat during my wear time. Shown in three coats and sealed with a glossy topcoat. Hecate can be described as a dark grey linear holo with added micro holo glitter and red/purple shimmer. Named after the goddess of magic, witchcraft, and the undead. I love the tone this hits, not quite black, but not too greyish. And don't even get me started on that shimmer! For me The formula has a sheer application, but it builds up nicely to an opaque even finish. There is a slight gritty finish, but a thick layer of topcoat easily smooths it down. Shown in two to three coats and sealed with a glossy topcoat. 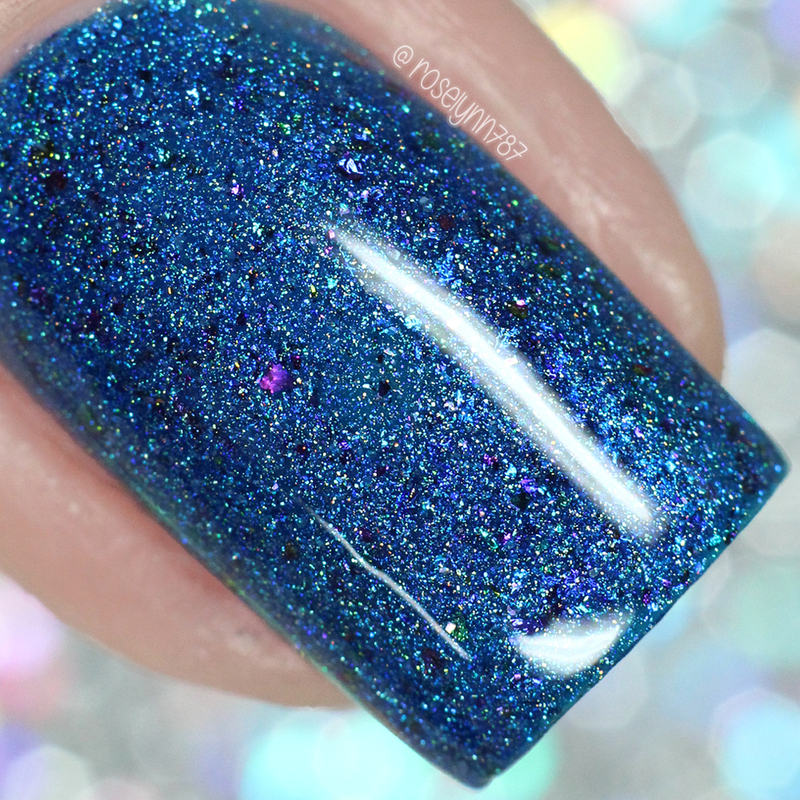 Uranus can be described as a linear holo with a lot of added micro-fine holo glitter in a blue/purple duo-chrome base. Named after the god of the skies and heavens. Am I the only one getting a glistening snow vibe from this? Totally loving it for the upcoming winter season. The formula has a sheer application and a bit of a thick consistency. Definitely still very manageable, but it lends itself to using fewer layers. It also dries to an extremely textured finish, so I ended up doubling up on the topcoat to smooth it down. Shown in two coats and sealed with a glossy topcoat. Overall I think these shades are absolutely gorgeous and definitely capture the regal vibe of the gods they are named after. Without a doubt the stand out shade among the collection and my pick for must-have is Aeolus. The flakies in the finish really bring it over the edge and give it a gorgeous complexity. So that's my favorite, which one is yours? Let me know down in the comments which one you're loving! To recap, the Gods and Goddess Collection Part 2 by Stardust Beauty will be available for pre-order now until October 29th at 8PM EST. The collection will then be released in the shop on November 1st at 6PM EST. Each full-size 15mL bottle retails between $9 to $12, depending on the finish. I don't even know which shade I like best. I agree, Uranus is giving off a shimmering snow vibe (I couldn't even type that without giggling). All of these were so good. Your swatches give me life!! Oooh the sparklies! They're stunning! Your swatches are gorgeous! I need all of these! I love most of what Drema creates! These are all coming home with me.